This new project is modern, urban living in a truly exceptional location. Luxury suites overlooking a lush, wooded grove in the Tam O'Shanter - Sullivan neighbourhood of Scarborough, minutes to Fairview Mall and a brand-new community centre, plentiful dining options … these are just some of the benefits of living at this Condos. 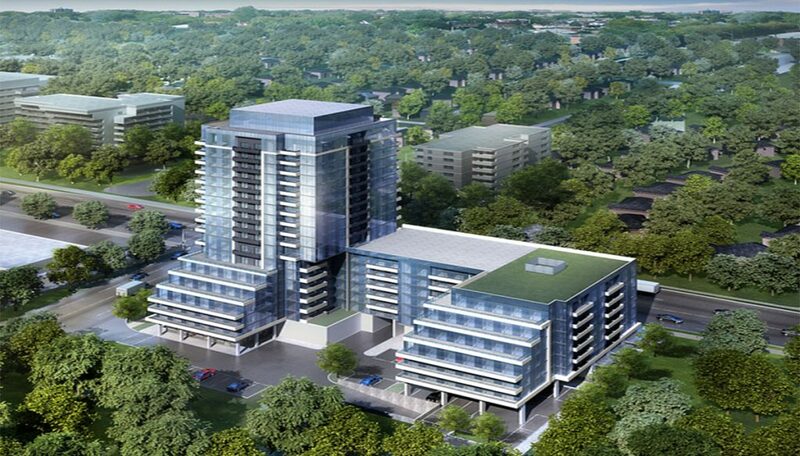 This Scarborough condominium by Liberty Development is in the pre-construction phase. 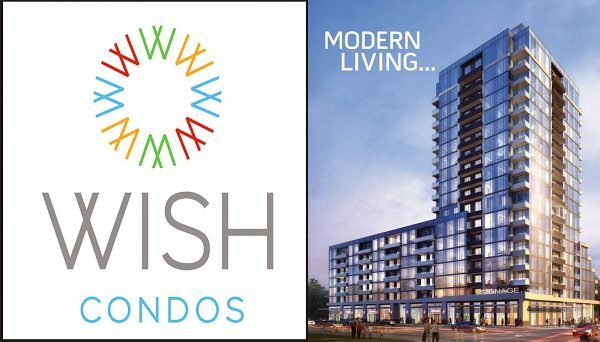 Wish Condos is scheduled for occupancy in 2021. This new building will occupy the southeast corner of Sheppard Avenue East and Pharmacy Avenue.Reaching 18 storeys, this unique building has a series of stepped terraces that cascade downwards toward the woods at the rear, showcasing beautiful, tranquil views of nature’s greenery. With approximately 11,000 square feet of retail on the ground floor, the project will bring a sense of contemporary urban living to this natural setting. Expect to find a mix of one, two and three bedroom layouts here, with some containing dens or media rooms. Smart layouts will maximize space, and open-concept layouts with expansive windows make the most of natural light. Suites have clean, sophisticated designs with a variety of high-quality finishes for you to choose from. From granite counter tops and undermount sinks in the kitchen, to crisp white bathroom fixtures and contemporary glass balconies, the modern homeowner will be right at home in wish condominium. 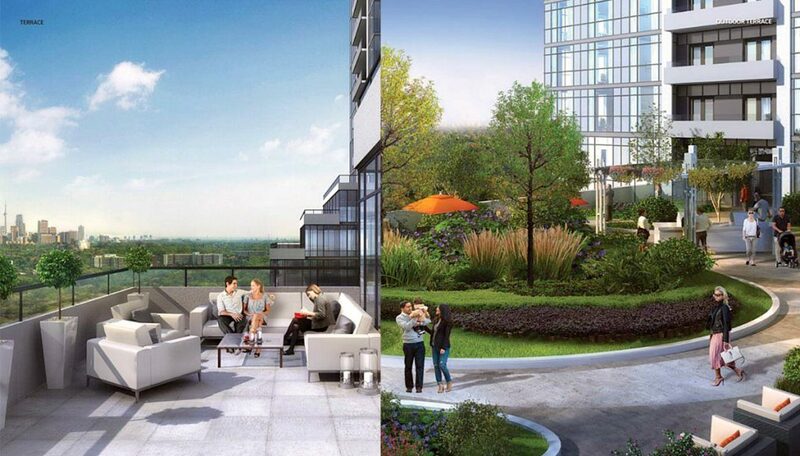 By far one of the most fabulous features will be its expansive, landscaped terrace. This outdoor space will take your entertaining to the next level, but it’s also a perfect spot to relax with a glass of wine as you overlook the urban forest, lush and green in the spring and summer, and even more striking when the autumn colours come out. Inside, you’ll find a party room and a sports lounge, as well as an exercise room with a yoga studio. This is one of Sheppard Avenue East’s prime sites and occupies an established neighbourhood. Overlooking Wishing Well Woods to the south is a huge bonus, but the condominium also has access to two key east-end arteries – Sheppard and Pharmacy – that offer quick connections in every direction. The bus stops right outside the condominium’s front door and is a five-minute trip to Don Mills Station, which connects you with Toronto’s main subway lines. From there, you can get to the heart of downtown Toronto in under 30 minutes. The TTC is also contemplating an LRT connection along Sheppard East, which would increase efficient, eco-friendly transit options even more. At Wish condos, you’re minutes from Fairview Mall, one of Toronto’s most popular lifestyle destinations. With 170 shops and services, this airy modern shopping centre is not only an architectural landmark, but features a fantastic selection of big-brand retailers, luxury labels and both casual and fine dining. A SilverCity Cineplex with 15 theatres and six 3D screens is the icing on the cake. Just across the street from Fairview is the brand-new Parkway Forest Community Centre. This 50,000-square foot facility boasts a full-sized gym, running track, dance studio, pool and rooftop garden. With dozens of cultural, educational and fitness programs for residents of all ages, it’s a great resource to have nearby. The centre also hosts a YMCA-run daycare, which offers childcare for infants through pre-school age children, a rarity in the GTA. Schools, parks and libraries are all nearby as well, making the site of this building a great choice for families and single professionals alike. Liberty Development is a driving force in growth throughout the GTA. They prefer to craft their luxury developments on formally underutilized land, identifying spaces that are public transit oriented and close to desirable amenities. From sleek downtown condos to mixed-use communities in up-and-coming suburbs, their developments have received many industry awards, including BILD’s Places to Grow Community of the Year award in 2009, 2010 and 2016. 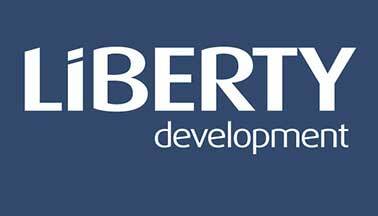 Read more about Liberty Development.